The Hicksville Middle School robotics teams. 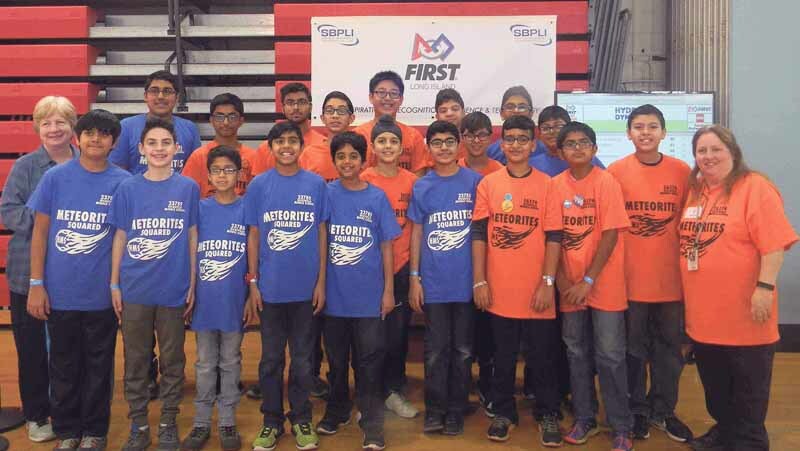 Under the leadership of advisers Catherine Temps and Carol Anne Brucato, the Hicksville Middle School robotics teams performed impressively at the First Lego Regional Qualifiers, themed Hydro Dynamics. Students were judged on the performance of their robots with specified tasks, their project presentations, and their core value representations. The Meteorites team earned the Core Values Teamwork Award and the Alliance Award, while the Meteorites Squared team earned the Core Value Inspiration Award and the Robot Design/Robot Performance Award. Meteorites Squared was also the top scoring team at their Regional Competition, which qualified them to move on to the Long Island Championship in March.